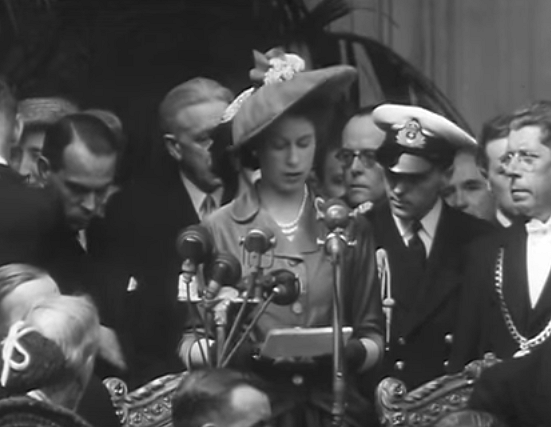 A few months after their marriage, Princess Elizabeth and the Duke of Edinburgh made an official visit to Paris. It was Elizabeth's first trip outside the Commonwealth, and the press covered it extensively. 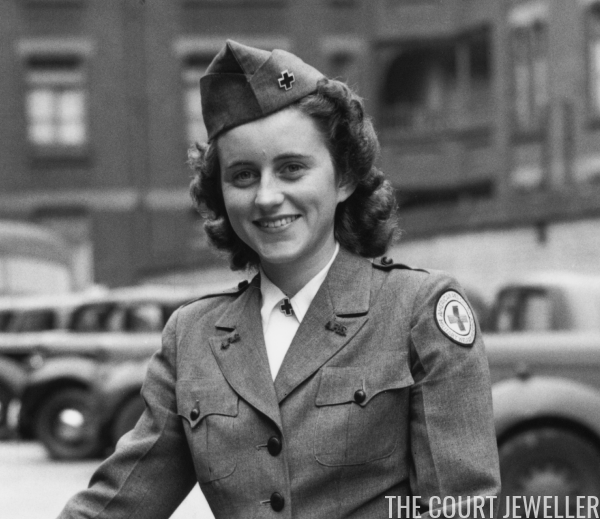 Here's a look at some of the clothes and jewels that she wore on the four-day trip. The trip, the first outside of Britain that Elizabeth and Philip made as a married couple, was designed to coincide with the opening of a major exhibition about British life in Paris. But there were a few wrinkles in the planning. For one: Elizabeth (pictured above in April 1948) was expecting a baby. Kate Williams writes in The Young Elizabeth that she was "sick and tired in the early months of pregnancy." American newspapers speculated intensely about the princess and the stork, but the palace decided not to make an official announcement until after the Paris trip. On top of that, the Associated Press reported that French police were worried about a possible plot to "assassinate or kidnap" Elizabeth, although a British spokesman described the plot as "highly improbable." Extra security measures were reportedly taken during the couple's visit. Despite concerns, the trip began as planned. Elizabeth and Philip traveled by night train ferry from Dover to Dunkirk; because of their nighttime traveling schedule, newspapers noted that they did not view the evacuation beaches. They arrived in Paris by train the next morning, disembarking at the Gare du Nord on Friday, May 14, 1948. The Associated Press reported that "Elizabeth wore a grey coat and white hat," while Philip "was garbed in naval uniform." The United Press added that Elizabeth added a "a splash of color to her good will visit with pink and white roses on her hat." Upon their arrival, Elizabeth and Philip proceeded to the British Embassy. The United Press wrote that a gift was waiting there for Elizabeth: "a silver vanity case, a gift of the Paris municipality. It was set with emeralds and sapphires and bore in gold the shield of Paris and silver replicas of famous Paris landmarks." Around noon, the couple arrived at the Elysee Palace, where "President Vincent Auriol decorate[d] Elizabeth with the Grande Cross of the Legion of Honor and Philip with the Croix de Guerre with palm," according to Associated Press reports. Philip's citation was particularly poignant, as it honored his naval service during World War II. The Legion d'Honneur was the first foreign order that Elizabeth ever received. We get another view of the princess's brooch from newsreel footage of the visit to the Elysee Palace. Reuters noted that, after the presentations, Elizabeth and Philip drove to the Arc de Triomphe, where "the princess placed a wreath on the tomb of the unknown soldier." According to the Sydney Morning Herald, "The Princess wore over her powder-blue suit the red sash of the Grand Cordon of the Legion of Honor which half an hour earlier she had received from the President of France." A brooch is visible on Elizabeth's lapel as she signs the Golden Book. Newspapers noted that "tears streamed down Elizabeth's face" as crowds cheered during their drive back to the British embassy. On the afternoon of the first day of the visit, Elizabeth officially opened the exhibition celebrating eight centuries of British life in Paris at the Galliera Museum. Her speech, which she delivered in French touched on the dangers of "narrow-minded nationalism." She declared, "The time has come when all men who wish to preserve the values for which you and we have fought two wars side by side must look well beyond their own frontiers. No country is morally self-sufficient any more than it is economically self-supporting." Elizabeth wore her Sapphire Chrysanthemum Brooch for the speech. An official dinner was given for the couple at the Elysee Palace that evening. Eagle-eyed reporters noted that Elizabeth didn't touch the glass of champagne that had been given to her. They also praised her fashion, both for the daytime and evening events of day one. The United Press wrote, "Elizabeth sported two New Look ensembles, a grey one for morning and a blue one for afternoon. Her evening gown was set off by a glittering diamond tiara." The tiara was the Girls of Great Britain and Ireland Tiara, a wedding gift from Queen Mary. Elizabeth also wore her South African Diamond Necklace and the diamond bracelet that Philip had given her as a wedding present. Day two of the visit, Saturday, May 15, began with sad news: Kathleen, Marchioness of Hartington, who was born Kathleen "Kick" Kennedy, had perished in a plane crash in the south of France on the afternoon of May 13. Her lover, the Earl Fitzwilliam, had also died in the crash. Elizabeth and Philip cabled their "deepest sympathy" to Kathleen's father, Joseph P. Kennedy, who had served previously as ambassador to Britain. (He's known better these days, of course, as the father of President John F. Kennedy.) The elder Kennedy was in Paris during the time of the royal visit. The main events of the second day at the visit took place at Versailles. Madame Auriol gave a luncheon for the couple at the Grand Trianon, the 17th century villa that belonged to King Louis XV. Philip again wore his naval uniform, while Elizabeth wore "a lime green-suit with a white straw hat decorated by a big white silk bow," according to wire reports. The princess's figure was gaining increasing attention for more than her attire, and the United Press reported that the royal press office was attempting to stave off speculation: "Palace authorities have asked photographers not to take pictures of the royal heiress while she's standing during her public appearances scheduled for May and the first week of June." After lunch, the couple toured the Palace of Versailles. Reuters reported that Elizabeth "was especially interested in everything associated with Queen Victoria, and she followed the route taken by Queen Victoria with the prince consort in their visit to King Louis Philippe in 1842." The visit to Versailles also conjured up memories of her parents' visit there a decade earlier. They returned to Paris, where they took a boat ride on the Seine, sailing in a French naval launch named "Princess Elizabeth." Elizabeth's gold trellis brooch was visible on her coat; she also wore a two-stranded pearl necklace and the diamond and pearl studs that were originally part of the Duchess of Gloucester's Pendant Earrings. Elizabeth had worn the earrings on her wedding day in 1947. A reception was held for the couple at the British embassy on Saturday evening. Newspaper reports noted that Elizabeth "triumphantly took the most difficult hurdle of her French visit" at the reception when a group of 500 guests waited to meet her, but it was Philip who ended up having an even tougher evening. Kate Williams noted that he "suffered a painful bout of food poisoning at a dinner at the British embassy." He had apparently recovered quickly, as he did not miss any scheduled events the following day. On Sunday, May 16, the royal couple began the third day of the visit by attending Anglican church services, first at a church in the Rue d'Aguesseau, and then at the British embassy across the street. The Ottawa Journal remarked that Elizabeth "wore a green dress with white hat and white shoes," and Philip "in a navy blue lounge suit, carried a bowler hat." More presentations at the embassy followed after church, and then lunch with the Canadian ambassador. One of Elizabeth's favorite engagements from the trip must have been Sunday afternoon's visit to Longchamps racecourse, where she and Philip watched three races from the presidential box with Madame Auriol. The Associated Press reported that Philip "more or less broke even on a horse named OK." The report added, "Elizabeth wore a gray blue and white printed frock and long white gloves. Her hat, shoes, and handbag were also white. Philip was in civilian dress." 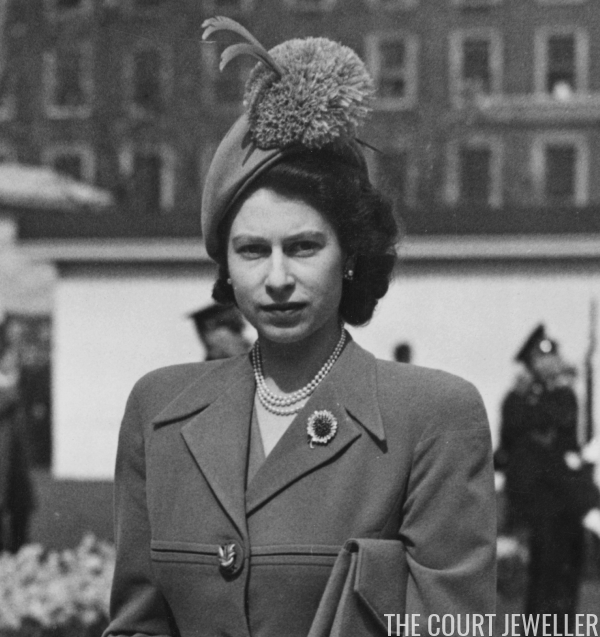 She appears to have worn the Sapphire Chrysanthemum Brooch on this occasion as well. On the way back from the track, they made a short detour to call on family. The Sydney Morning Herald wrote that "the Princess and the Duke called on Prince Philip's uncle, Prince George of Greece, who kissed them warmly as they arrived at the door of his house." George and his wife, Princess Marie Bonaparte, lived in Saint-Cloud. On Sunday evening, the couple dined at Le Tour d'Argent, a Parisian restaurant. Elizabeth wore an evening gown with pearls and a white fur jacket. They capped off their third day in Paris with a jaunt to one of the city's most popular nightclubs, Chez Carrere in the Rue Pierre Charron, where they were entertained by the famed French singer Edith Piaf. The Associated Press wrote that the couple "danced in a caberet until the small hours Monday morning," reportedly leaving the club around 1:30 AM. Williams notes some "Scottish church organizations" were upset about Elizabeth's visits to the racetrack and the nightclub, because they "believed she set a poor example to the young people of the Empire." Philip's behavior apparently required no comment. Monday, May 17 was the final day of the couple's visit to Paris. They toured the gardens and the chateau at Fontainebleau, the former summer home of the French royal family. A planned picnic in the forest was canceled due to security concerns. A luncheon at a local restaurant was the substitution. On Monday evening, the final event of the visit was a visit to the ballet at the Opera Garnier. Newspapers reported that 5000 locals gathered outside the opera house, most cheering, but some booing audibly when the couple failed to make an appearance on the building's balcony. The couple's car was momentarily swarmed by members of the crowd who broke through police barriers on the way back to the embassy that evening. The visit officially came to an end on the morning of Tuesday, May 18, when the couple flew back to England. The Canadian Press reported, "The royal couple flew from Le Bourget field in Paris in a Viking airliner of the King's Flight after cheering crowds had lined their route from the British embassy ... The princess wore a light fawn silk dress with shoes to match. Prince Philip was in naval uniform." Overall, the visit was hailed as a success. Williams notes, "The papers declared that the Norman Conquest had occurred once more, but in reverse: the Princess had subjugated Paris."